Anyone who freely thinks for himself regarding Turkish President Erdoğan's one-man rule, at home or abroad, can get the label "terrorist." On April 25, a Turkish court sentenced 14 staff members of the opposition newspaper Cumhuriyet to prison on charges of "terrorism," and handed down sentences ranging from 2½ years to 7½ years. When Erdoğan is not fighting hundreds of millions of "terrorists," including almost the entire European continent, the U.S. and probably half his own nation, he is busy cultivating deeper ties with countries such as Russia, Sudan and Iran. For Hamas and the Muslim Brotherhood, for instance, the entire Western civilization is a terrorist machine programmed to spill Muslim blood. Turkey's strongman, President Recep Tayyip Erdoğan, is no exception. "We don't have the shame of invading on us, Netanyahu. You are an invader and right now are present in those lands as an invader. At the same time, you are a terrorist." In another speech, again apparently succumbing to amnesia regarding decades of Arab and Muslim wars against Israel, he said: "You [Israel] are a terrorist state. It is known what you have done in Gaza and what you have done in Jerusalem. You have no one that likes you in the world." -- as if the entire world were a fan of Erdoğan. "You [France] will not be able to explain this. You will not be able to rid yourself of this terror burden... As long as the West nurtures these terrorists, you will sink". Then, there is the United States that "works with the terrorists:" In February Turkey warned American soldiers in Syria of the possibility of being treated as terrorists if they keep backing Kurdish militants. Deputy Prime Minister Bekir Bozdağ threatened that U.S. soldiers risk being caught up in clashes and that Turkish troops would not make a distinction if Americans appear in Kurdish uniforms. In the worldview of the Turkish government, almost the entire continent of Europe is made up of terrorist states. In an April 25 speech, Prime Minister Binali Yıldırım accused European nations, with the exception of Spain, of supporting terrorist organizations. A few weeks earlier, Yıldırım warned Bosnia-Herzegovina, a state friendly to Turkey, that it could be a target if it supported the "Gülenist terror organization," a reference to the Muslim cleric, Fethullah Gülen, who was once Erdoğan's staunch ally, but now is in self-imposed exile in Pennsylvania. Anyone who freely thinks for himself regarding Erdoğan's one-man rule, at home or abroad, can get the label "terrorist." On March 24, Erdoğan criticized anti-war students at one of Turkey's best universities, Boğaziçi, calling some of the people there terrorists after a fight that erupted on campus over Turkey's military incursion into a Kurdish enclave in neighboring Syria. He called the protesting students "communist, traitor youth" protesting a "religious, nationalist, local youth." The "communist, traitor youth" were immediately detained. On April 25, a Turkish court sentenced 14 staff members of the opposition newspaper Cumhuriyet to prison on charges of "terrorism," and handed down sentences ranging from 2½ years to 7½ years. Another defendant in the case, who was not employed by Cumhuriyet and had been charged for his activities on Twitter, got the stiffest sentence, 10 years. "It has been journalism itself that has been in the dock and today's verdicts defy logic and offend justice," said Milena Buyum, Turkey campaigner at rights group Amnesty International. 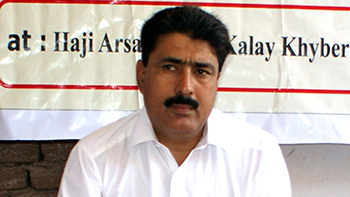 "These politically motivated sentences are clearly intended to instill fear and silence any form of dissent." All that is insane. When Erdoğan is not fighting hundreds of millions of "terrorists," including almost the entire European continent, the U.S. and probably half his own nation, he is busy cultivating deeper ties with countries such as Russia, Sudan and Iran. During a December visit to Sudan, Erdoğan called his host, President Omar al-Bashir "his brother". Sadly, Erdoğan's brother, al-Bashir, is a man who is wanted by the International Criminal Court on charges of genocide and war crimes against his people. Erdoğan, meanwhile, is allying with Russia and Iran, ironically, to topple Syria's Russia- and Iran-backed dictator, Syrian President Bashar al-Assad and to "bring peace to Syria" while invading the Kurdish enclaves in the country's north. In Erdoğan's ideological divide, the world consists of "terrorist" countries such as the entire continent of Europe (minus Spain), plus the U.S. and half of his own country -- as opposed to "noble" countries such as Russia, Sudan and Iran. Erdogan is an Islamist who is keen on wiping out any form of opposition to his rule. Islamist ideology does not allow any form of dissent consequently, anyone who is a democrat calling for freedom of expression and opinion is considered a threat and a terrorist in Erdogan's Turkey.Those who are languishing behind bars in Turkish prisons have not been given the right to a free and fair trial- including academics, civil servants, journalists and intellectuals. An Islamist Turkey with Erdogan as a supreme leader will be a far cry from a stable, democratic Turkey and it will lead to instability in the region. With all due respect, Burak Bekdil does not understand the great leader Erdogan: Recep Erdogan is simply trying to replace Ali Kamil Poyrazoglu as Turkey's greatest comedian. A great country has been brought low by a moron and his ilk. Why is Turkey still allowed to be in NATO? Apparently being anti-western in values and acting the despot, is not enough to expel that country. Erdogan's aims to revive the Osmanli Empire, and install himself as its khalifa (caliph), is only matched by his bloated, arrogant ego. Hopefully, this man's neo-Nazi fascism will be destroyed in it's embryonic state before he assembles his worldwide Islamic army to invade Israel. His end will be not be good in such a case (see prophet Zechariah chaps 12-14; Ezekiel chaps. 38-39, etc). Sadly, Erdogan has done a pretty good job in eliminating any and all opposition in Turkey. I'll wager that pretty soon we will see all statues of Ataturk being removed. Once again it's painfully obvious that Turkey under the dictator Erdogan has no business being in NATO much less the EU. Alright, everybody is a terrorist for Erdogan. Isn't he a terrorist himself? He threatens all the countries, he calls all his opponents "terrorists", he has all his political opponents inside Turkey in prison, he captures other countries' people and negotiates them with things he needs, he calls the kurds 'terrorists' as if he knows all of them name by name, he allies with ISIS and many other things. The west has to be prepared for his next steps. He might even have an aggressive military action against western countries if he notices he is losing the most funny ever declared elections. The west has to support all the countries around Turkey, at any cost, before he repeats the same story as Hitler. We all know what happened when they didn't stop him when they could... let us not count the numbers of victims ONE man caused. We should get rid of the one man, before he kills millions. As I have said before here, Erdogan is the Turkish Hitler, everything he does is an echo of Hitler, his speeches and comments are as hysterical and non factual as the speeches made by Hitler and Goebbels in the heydey of Nazi rule. He clearly sees himself as the ruler in waiting of the Middle East and probably caliph of Islam. The one flaw in his plan is that the Arabs are unlikely to welcome back the Ottomans whom they were very glad to be rid of after WW1. 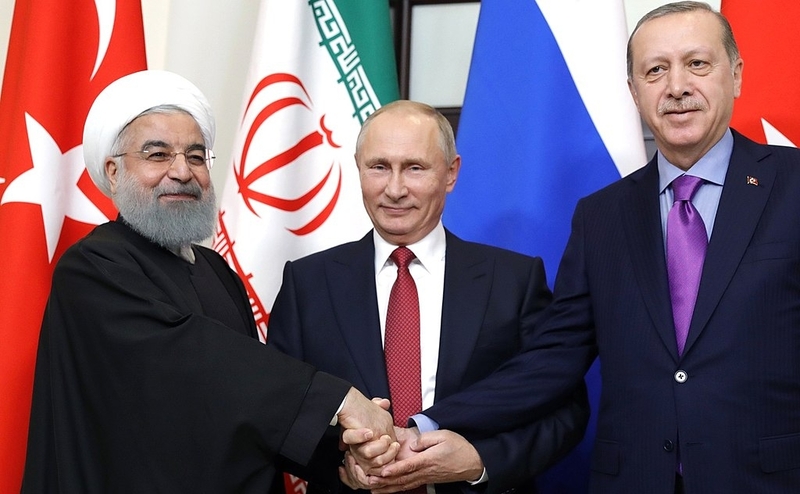 The "Three Musketeers" --Putin, Rouhani, Erdogan-- 3 totalitarian minded, with objective to expand their power/control base with an iron grip on their citizens/slaves. It seems to me that most Middle East despots are themselves the terrorists. As well, they don't seem to know reality from make-believe and create their narratives as the fancy takes them. They are prepared to lie, create their own narrative for anything they decide to discuss and slander anyone who they consider an enemy, of which they have plenty! Not one of them can be trusted and we can only do our best to avoid contact with any of them. There do seem to be a few who are rational and clear-headed, but they are definitely few! I have, and have had, a terrible sinking feeling regarding Turkey for quite some time now. I believe it's only a matter of time until they betray NATO ! Don't forget, their armed forces are massive. I believe in NATO they are second only to the U.S. It is hoped that Brussels will understand that there is no way Turkey can be considered as a member of the EU now or in the future. Apart from Erdogan's views on the West or East, the country is not part of Europe, except from the tiny area around Istanbul, and the people are not European, thus not qualified in any way.